Accenture’s recent investment in Digital Asset Holdings is a clear indication of just how strongly we feel about the role of blockchains is the future of investment banking. In my last post, I shared my predictions for how the technology will unfold in capital markets over the next decade. This time, I want to take a closer look at the benefits that investment banks can expect and some of the challenges that the industry will need to tackle in the coming months and years. Capability for optimized settlement times. This technology makes it possible to clear and settle transactions at different speeds depending on user needs—in seconds for retail traders versus hours or days for market makers who require longer settlement times to compress / net trades to be efficient and effective. Opportunities for market and product segmentation. User-optimized settlement times, in turn, make it possible for new products and risk based pricing options that will help participants better optimize their trading activities. Improved collateral management. The transparency and control of blockchain-based solutions will unlock significant new capabilities to manage and optimize cross-asset collateral, which will unlock vast amounts of capital that would otherwise be trapped in the system. Lower regulatory reporting costs and greater transparency. With a shared transaction ledger, the potential for regulators to directly access the information they need could eliminate tremendous cost and effort that is spent today to produce the necessary regulatory reports. Of course, blockchain technology is not without its challenges. Among other things, regulators and industry must strike a balance between the privacy and traceability of trading data, find ways to protect distributed ledgers from group reorganization, and be confident in the technology’s ability to scale without latency. ‘Smart Contracts’ or ‘Programmable Assets’ have been hotly debated recently where proponents cite the potential efficiency of further automating the execution logic for certain types of products. However, for capital markets, most now recognize that the immaturity of the technology, controls and processes required to handle the situations when it goes wrong make it a premature dialogue at this point. For example, what happens when a data feed isn’t available? What happens when one counterparty defaults or doesn’t have the funds available for an automatically executing contract? Who has the right or responsibility to change an existing contract when it needs to be changed? Who can one turn to when there is a conflict or disagreement between counterparties about the agreement? One can envision future solutions to these problems, but for the near to middle term the notion of distributing self-executing code with financial ramifications on the scale of millions of contracts per day is a daunting prospect for ‘when it goes wrong’…and in capital markets, that is a certainty. Participants and regulators will require that there be a governing construct for these transactions. With that said, there are interesting use cases for ‘smart contracts’ in the wider financial services space that may come to fruition sooner. Accenture Technology Labs have some great demos of the potential in the payments and IoT realms. While it is too early for smart contracts right now in capital markets, we’ll be watching this debate closely to see how it unfolds. If you would like more information on this topic, please send me an email. 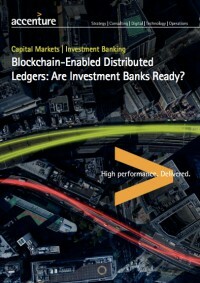 Nice thoughts on Blockchain technology enabled Distributed Ledgers for Investment Banks. Rapid adoption of Blockchain technology/Distributed Ledgers would not be feasible, until an increased level of market collaboration for development of industry standards, interoperability protocols and abilities to integrate with existing system/infrastructure take place. Even if market comes together on these issues, Regulatory and Legal Framework would certainly elongate the gestation period – diluting the intended impact and benefit from the technology.